As I briefly discussed on Twitter, seeing this made me think of my baby, Xenoposeidon. 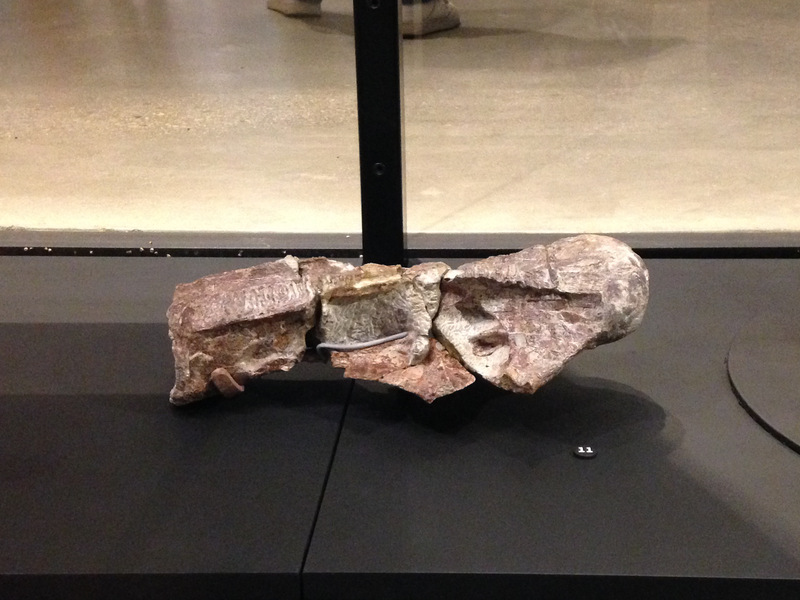 Now that specimen, beautiful though it is, preserves only the lower one third of the vertebra. But there are some clear commonalities, and they’re clearer if you look at the animation. 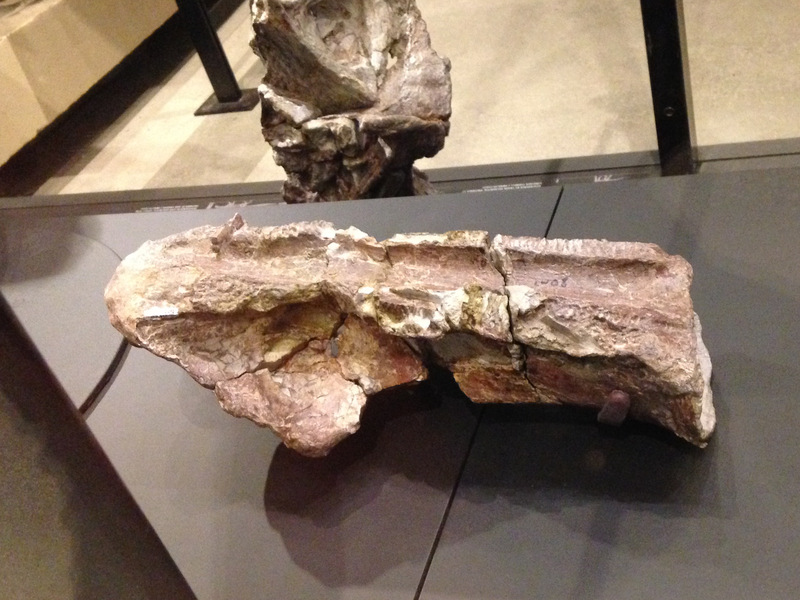 Most obviously, there are laminae running up and down the anterior and posterior margins of the lateral face of Xeno’s neural arch, and those same laminae seem to exist in Rebbachisaurus. We didn’t name these laminae in the Xeno paper, but if they’re the same thing as in Rebbachisaurus, then they’re ACPLs and PCDL — anterior centroparapophyseal and posterior centodiapophyseal laminae. If that’s right, then we misinterpreted the site of the parapophysis in Xenoposeidon. We (Taylor and Naish 2007) thought it was at the cross-shaped junction of laminae near the anterodorsalmost preserved part of the vertebra. In Rebbachisaurus, this cross exists, but it’s merely where the CPRL (centroprezygapophyseal lamina) intersects the ACPL. But there’s more. In Xenoposeidon, the base of the CPRL (if that’s what it is) forms a “V” shape with an accessory lamina that proceeds posterodorsally from the same origin. (This is one of the features that’s apparent on the more damaged right side of Xeno as well as the nicer left side.) 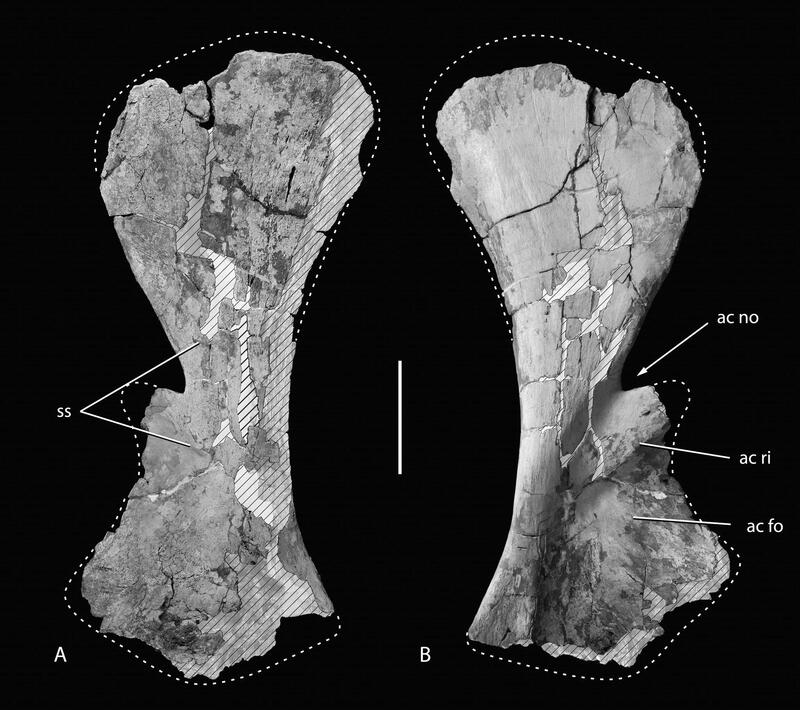 That lamina also seems to exist in Rebbachisaurus — but with the whole vertebra to consider, we can see that it’s not an accessory lamina, but a perfectly well-behaved CPOL (centropostzygapophseal lamina). So if Xeno is indeed a rebbachisaurid, then the two branches of the “V” go to support the pre- and postzygs, and the laminae running up the anterior and posterior margins of the centrum support the parapophyses and diapophyses respectively. There are actually two crosses on each side of the neural arch: one at the intersection of CPRL and ACPL, the other at the intersection of CPOL and PCDL; but in the Xeno specimen, the posterior cross is lost, having been just above where the break occurs at the top of the neural arch. In case it’s not clear, the grey lines are an (extremely crude) reconstruction, the blue lines label the important laminae, and the red circles highlight the two crosses. Hmm. The more I look at this, the more convincing I find it. But there’s more! 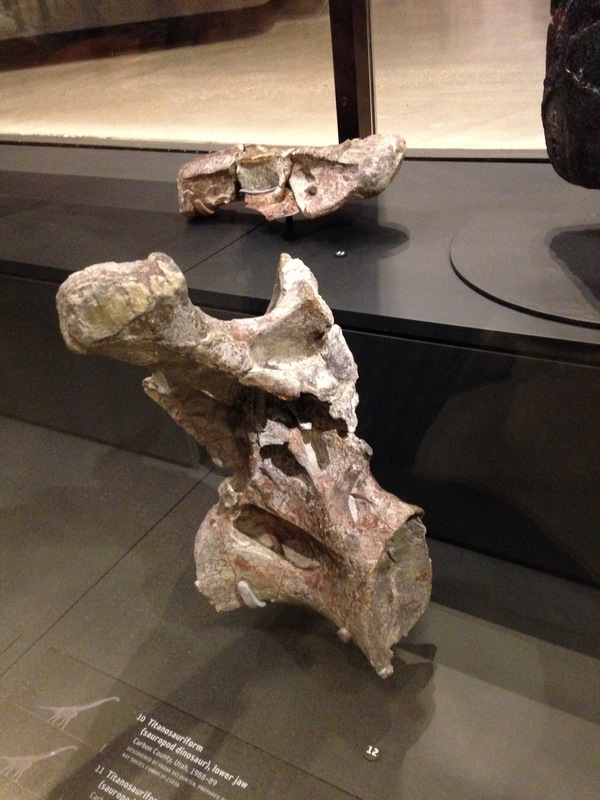 The anterior aspect of the Rebbachisaurus vertebra also bears a notable resemblance to what we see in Xeno, with a pair or arched laminae forming a vaulted roof to the neural canal. That’s not a bad call—the infrazygapophyseal region of that vert is elongate, and there is a nice CPRF and those closely positioned TPRLs could mean that prz’s are close to one another or even conjoined. It’s tantalizing, but not much to go on. Would be nice to prep out CPRF & work out laminae on lat sfc. Jeff is right that more preparation would help to figure this out. Not that everything about the Rebbachisaurus dorsal is Xeno-ish. Most notably, the lateral foramen is nothing like that of Xeno, being an uninspiringly dull and simple oval rather than the much more elegant foramen-within-a-fossa arrangement that we see in Xeno. But there are other points of commonality, too, such as the flat stretch of bone above the fossa and the way the posterior margin of the neural arch reaches the posterior margin of the centrum. 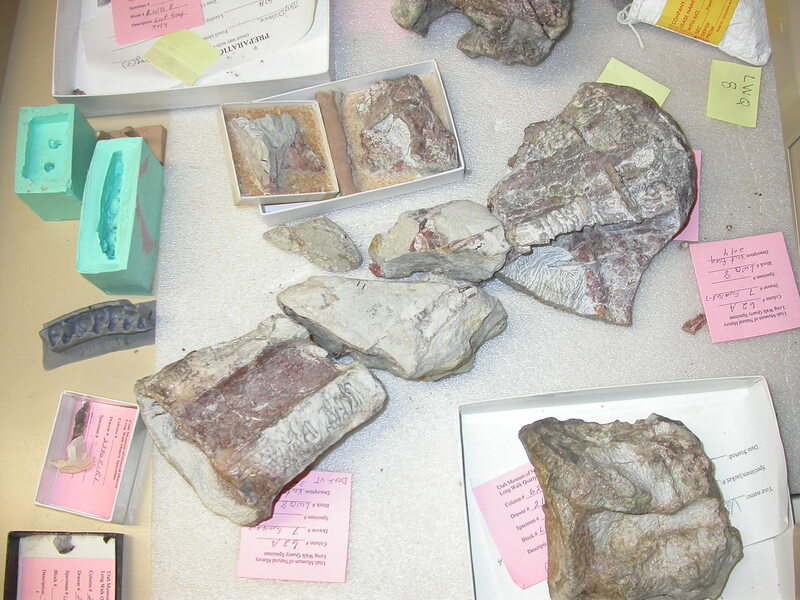 All in all — while there is plenty of work yet to do — I am increasingly inclined to think that the evidence we currently have suggests Xenoposeidon is a rebbachisaurid. If that’s right, it would be quite an exciting result. 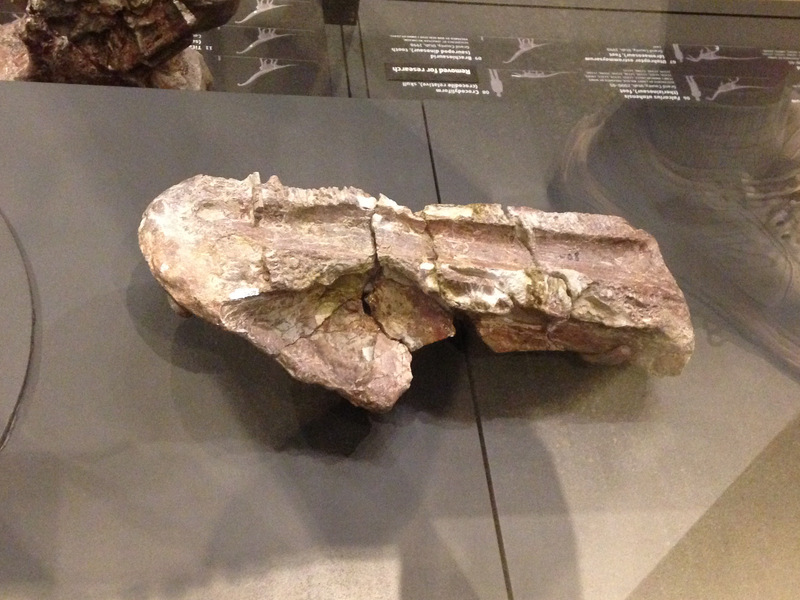 It would be the earliest known rebbachisaur, and the only named one from the UK. 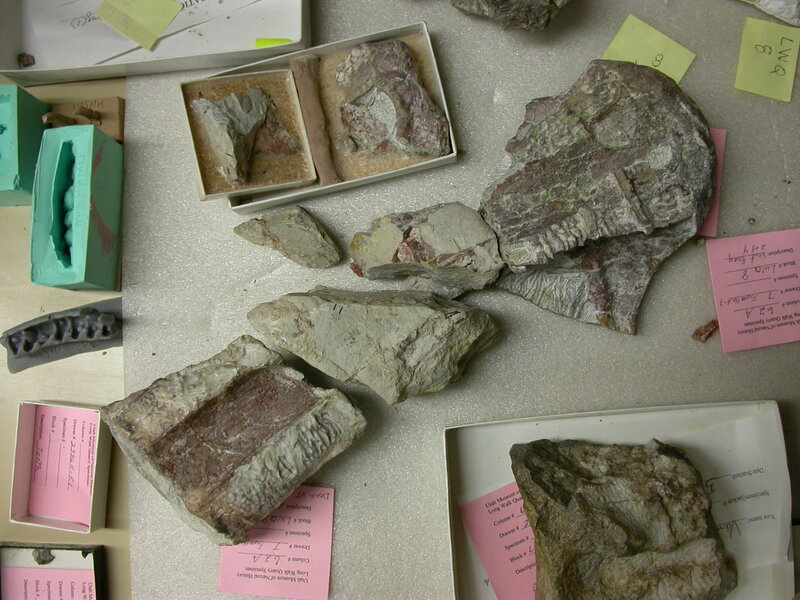 (Mannion 2009 described, but did not name, a rebbachisaurid scapula from Wessex formation of the Wealden). Could Mannion’s scapula be Xenoposeidon? Unlikely, as it’s 10 million years more recent. But it could be a close relative. 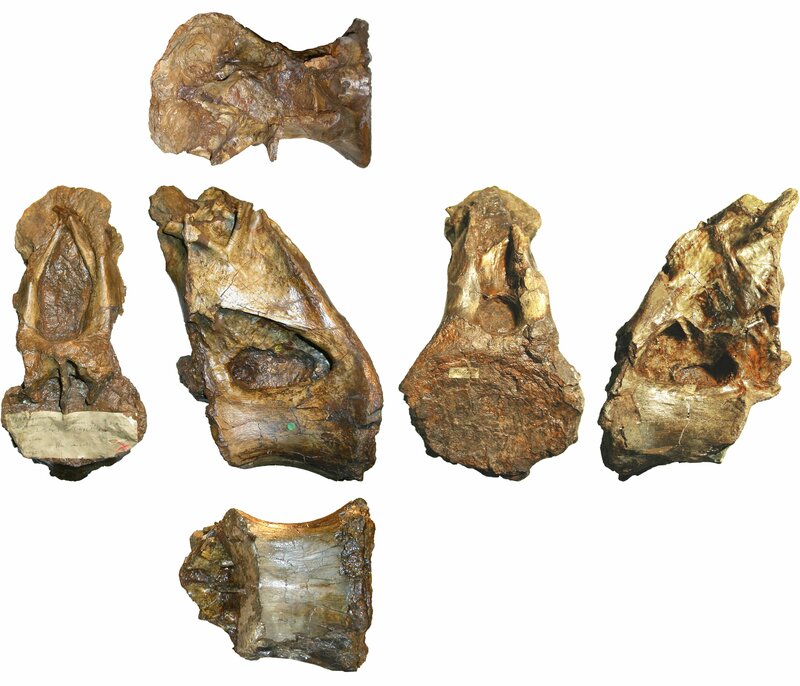 This just in: Wilson and Allain’s (2015) redescription of Rebbachisaurus garasbae, the type and only true species of Rebbachisaurus! Wilson and Allain (2015:figure 3). Holotype of R. garasbae. 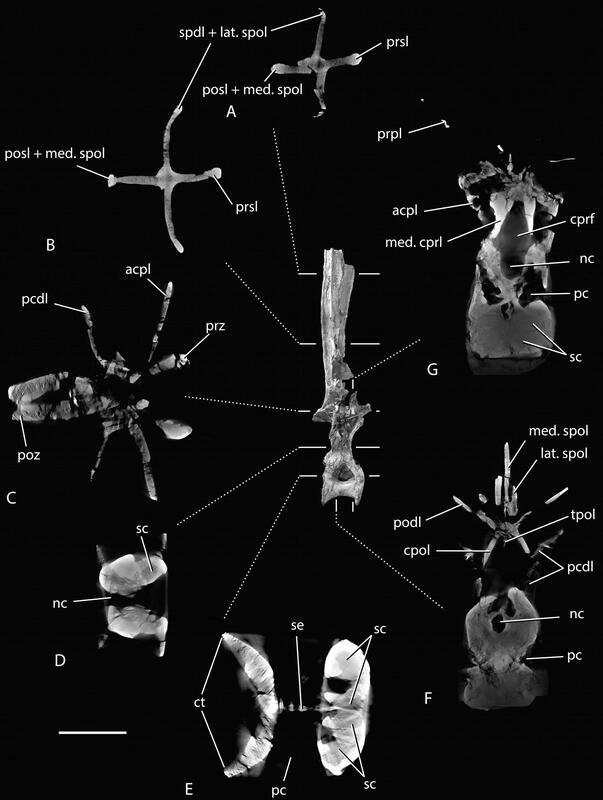 Dorsal vertebra (MNHN-MRS 1958) in anterior (A), right lateral (B), posterior (C), and dorsal cross-sectional (D) views. Anterior faces top in D. Scale bar equals 20 cm. 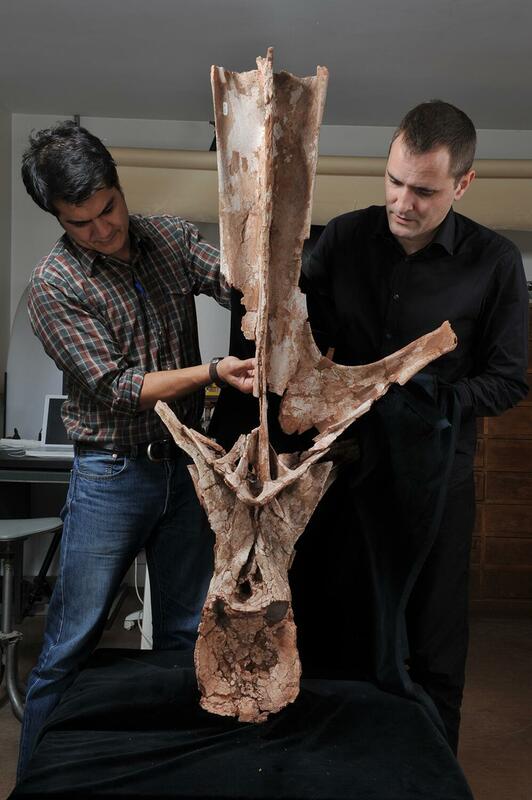 Jeff Wilson (left) and Ronan Allain (right), with dorsal vertebra of Rebbachisaurus. There’s good and bad news here. 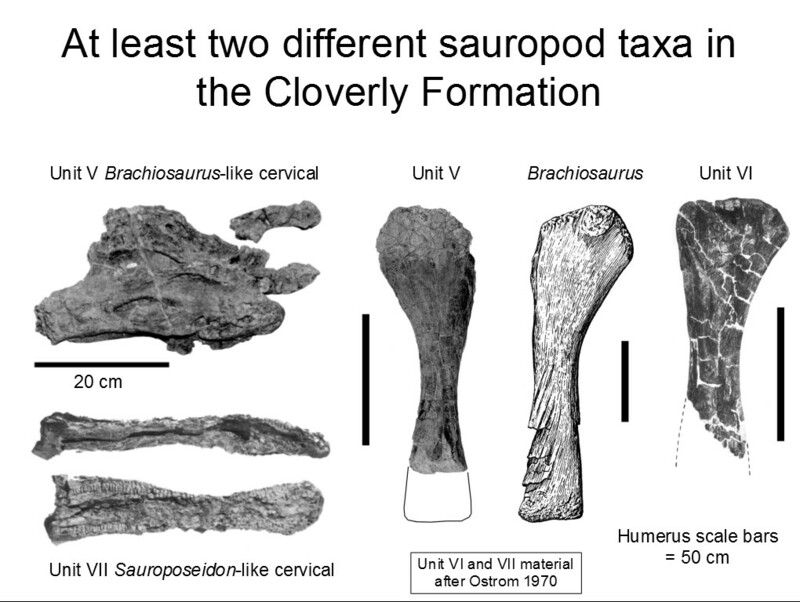 The good news is obvious: this is a really important specimen, the type of a whole sauropod family, and it’s been in dire need of redescription because Lavocat’s (1954) paper did a bit of a drive-by on it. It’s great that there’s a proper description at last. The bad news is, you can’t read it — at least, not unless you’re a JVP subscriber or at a wealthy university. It’s been a while, I think, since we wrote about a non-open access paper here at SV-POW!, and it’s funny how little we seem to have missed them. 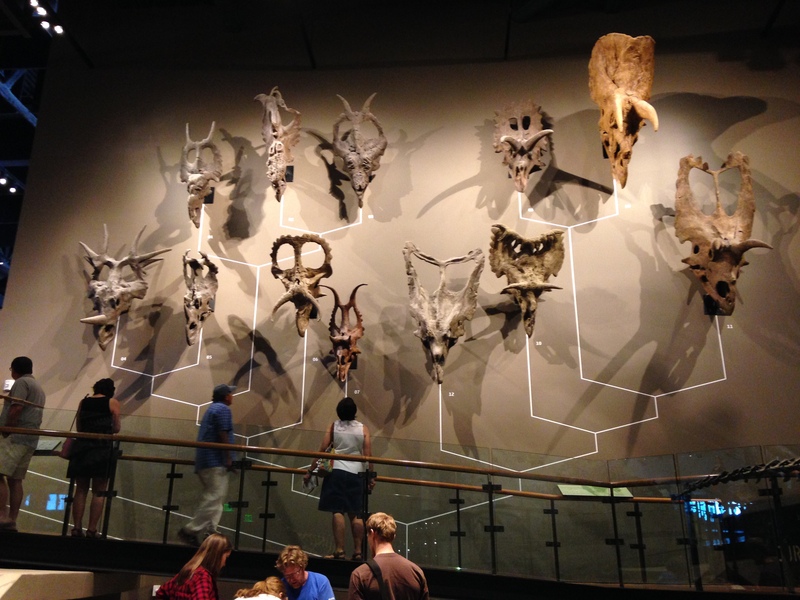 A lot of the action in vertebrate palaeo, especially for dinosaurs, seems to have moved to open access journals — especially PLOS ONE and PeerJ, but also of course the venerable Palaeontologia Electronica. Wilson and Allain (2015:figure 13). Holotype of R. garasbae. 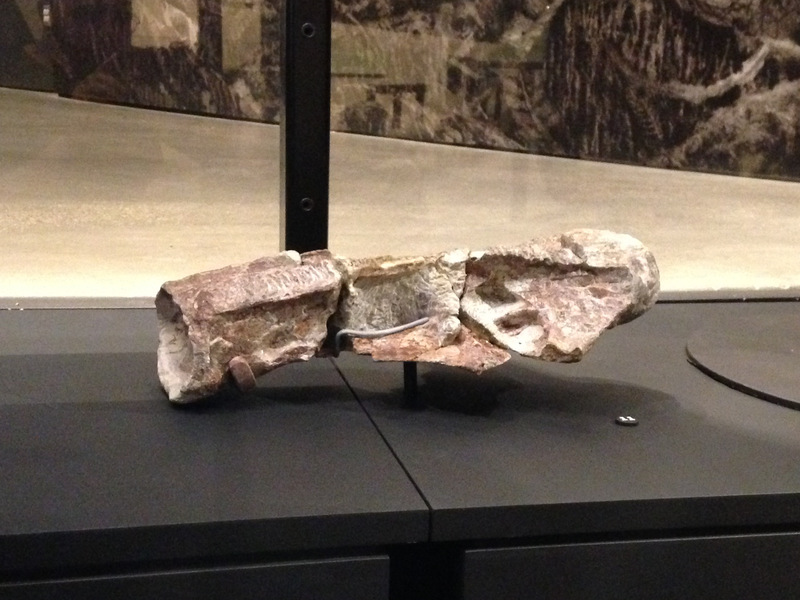 Right scapula (MNHN-MRS 1957) in medial (A) and lateral (B) views. Abbreviations: ac fo, acromial fossa; ac no, acromial notch; ac ri, acromial ridge; ss, origin of M. subscapularis. Inference of muscle attachment sites is based on comparisons with crocodile pectoral musculature (Meers, 2003). Reconstruction of distal margin of blade based on photograph of scapula in situ (Fig. 2A). Scale bar equals 20 cm. 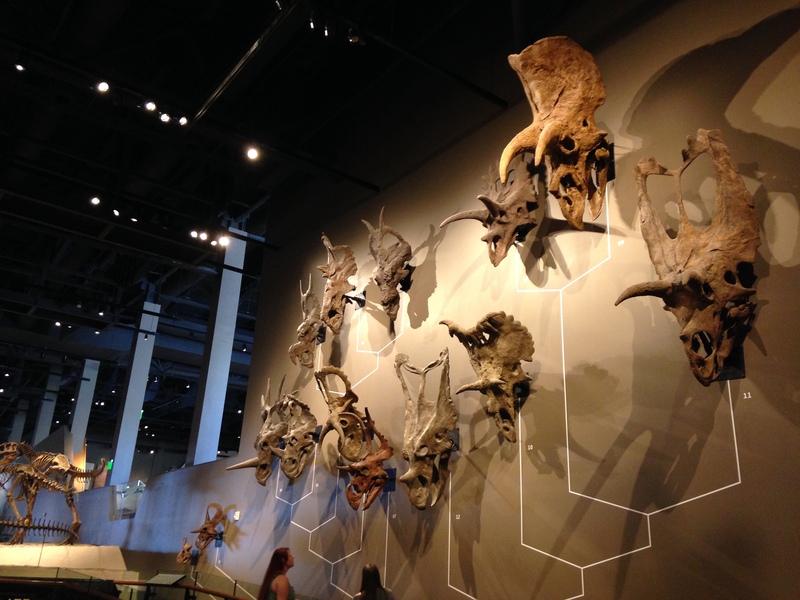 It’s no secret that I am done with JVP (and Palaeontology, and the Journal of Paleontology, not that I’ve ever had a paper in that last one) until they become fully open access journals — and no, a hybrid OA option doesn’t cut it. I’m glad to have that notch on my bedpost, but I don’t feel any need to go back there. But what I’d forgotten, or perhaps never really registered, is how terribly old-fashioned JVP papers look. No-one is disputing the journal’s high editorial standards or the importance of the work published there; but their tiny fonts, cumbersome two-column layout, and low-resolution black-and-white figures located bizarrely distant from the relevant text all make it feel like a journal badly in need of an overhaul for the 21st Century. I’m not sure what plans the Society has (it’s been years since I was a member) but I’d love to see JVP reinvented as a full-colour open-access journal, primarily online with printed copies only for those who want to pay for them. We’ll see. Wilson and Allain (2015:figure 5). Holotype of R. garasbae. 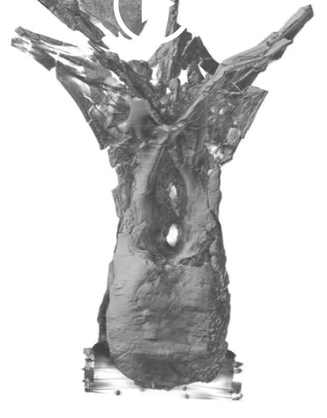 Computed tomography (CT) scans of the dorsal vertebra (MNHN-MRS 1958). A–E, transverse sections; F– G, frontal sections. Abbreviations: acpl, anterior centroparapophyseal lamina; cpol, centropostzygapophyseal lamina; cprf, centroprezygapophyseal fossa; ct, cotyle; lat. spol, lateral spinopostzygapophyseal lamina; med. cprl, medial centroprezygapophyseal lamina; med. spol; medial spinopostzygapophyseal lamina; nc, neural canal; pc, pleurocoel; pcdl, posterior centrodiapophyseal lamina; podl, postzygodiapophyseal lamina; posl, postspinal lamina; poz, postzygapophysis; prpl, prezygoparapophyseal lamina; prsl, prespinal lamina; prz, prezygapophysis; sc, subcamerae; spdl, spinodiapophyseal lamina; se, septum; tpol, intrapostzygapophyseal lamina. Scale bar equals 10 cm for CT images. 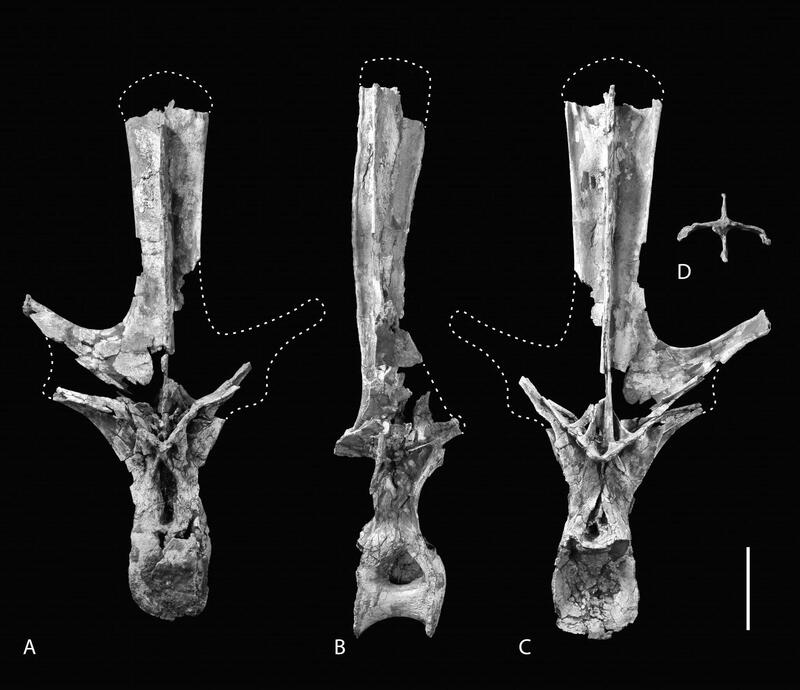 It’s great that Wilson and Allain had the Rebbachisaurus vertebrae CT-scanned, showing just how crazily lightly they are built: see figure 13, especially part A, above. 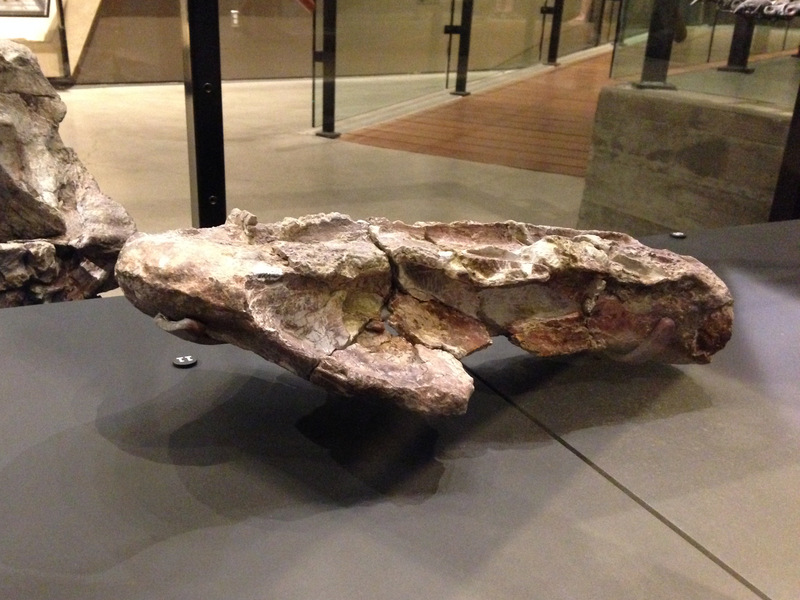 But I have to admit to finding it strange that a 34-page paper that deals in detail with sauropod pneumaticity doesn’t cite anything by either Brooks Britt or our own Matt Wedel — surely the two people who have done the most important work in this area, certainly the most foundational work. 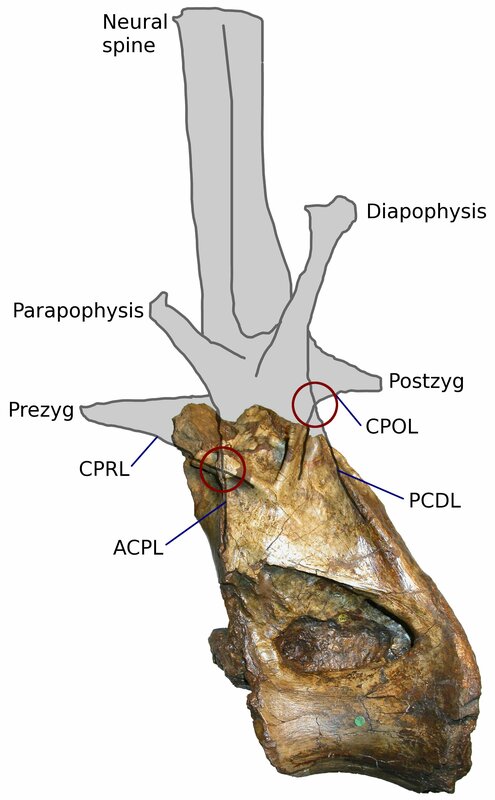 My 2009 paper (Taylor 2009, duh) does get a mention — not, this time, to disagree with me on the generic separation of Giraffatitan from Brachiosaurus, to but to acknowledge its recognition of the spinoparapophyseal lamina (SPPL) that occurs in D?8 of the Giraffatitan paralectotype MB.R.2181 (formerly HMN SII) and has now been recognised also in Rebbachisaurus. … but that’s for another time. Lavocat, R. 1954. Sur les Dinosauriens du continental intercalaire des Kem-Kem de la Daoura. 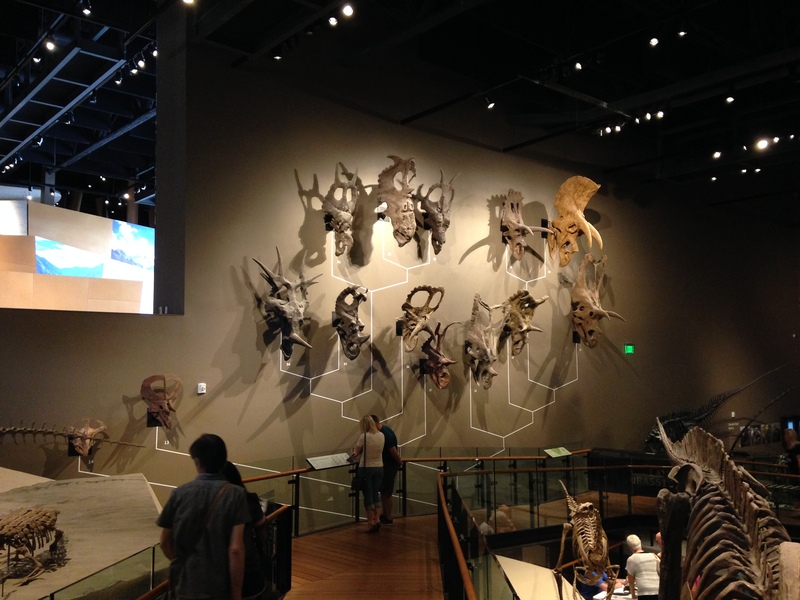 [On the dinosaurs of the Continental Intercalaire of the Kem Kem of the Daoura]. Comptes Rendus 19th International Geological Congress 1952(1):65-68. I wanted to get my initial report on the Joni Mitchell conference out quickly. But since posting it, more thoughts have bubbled up through my mind. I’m thinking here mostly about how a humanities conference varies from a science one. Now of course this is only anecdote, nothing like a scientific survey: my sample size is one conference (for humanities) and only one field for science (vert palaeo, natch), so we should beware of generalising from these observations. 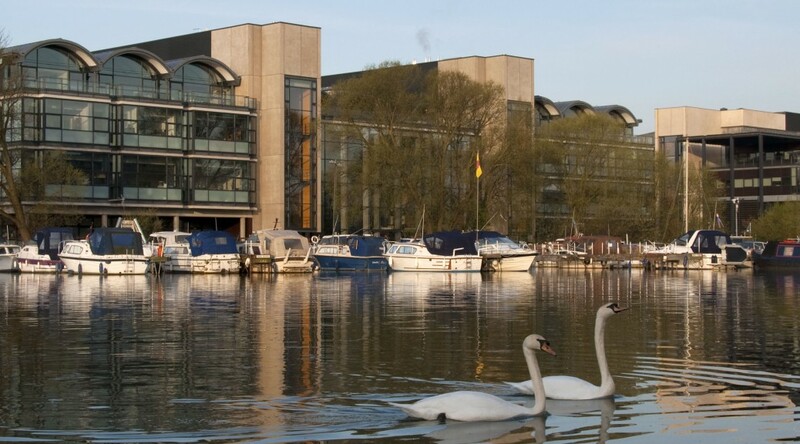 The Minerva Building of the University of Lincoln, where the main conference sessions took place. The Joni conference had mostly parallel sessions: a pair of panels early in the morning, then a pair in the later morning, then three simultaneous panels in the after-lunch session before dropping down to a single plenary session for the later afternoon. (My talk was in one of the three parallel panels, so less well attended than it might otherwise have been.) I don’t know how common this is in humanities conferences, but it’s never done at SVPCA or ProgPal. SVP, of course, does run parallel sessions — but then that is a very big meeting, with thousands of delegates. I used the word “panel” in that description, which I’ve not come across in science conferences. It refers to one of a set of parallel sessions. The idea is that all the talks in a panel are on a somewhat related subject, and the panel ends with all the speakers coming back to the front together, for a discussion with the audience and among themselves. 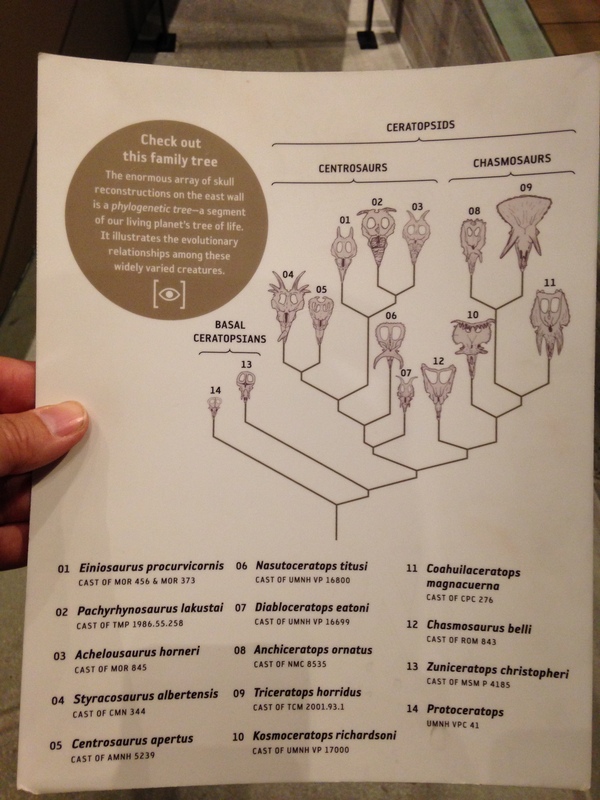 This is actually a really nice way to run things — much better than the very nominal Q&As at the end of SVPCA talks. It helps you to develop a sense of who people are, as well as digging deeper into the topics. My sense is that this is pretty typical of humanities conferences. Did I say “Joni”? One aspect of this conference that corresponded pretty well with my prejudices was a sort of liberal guilt that popped up its head from time to time. 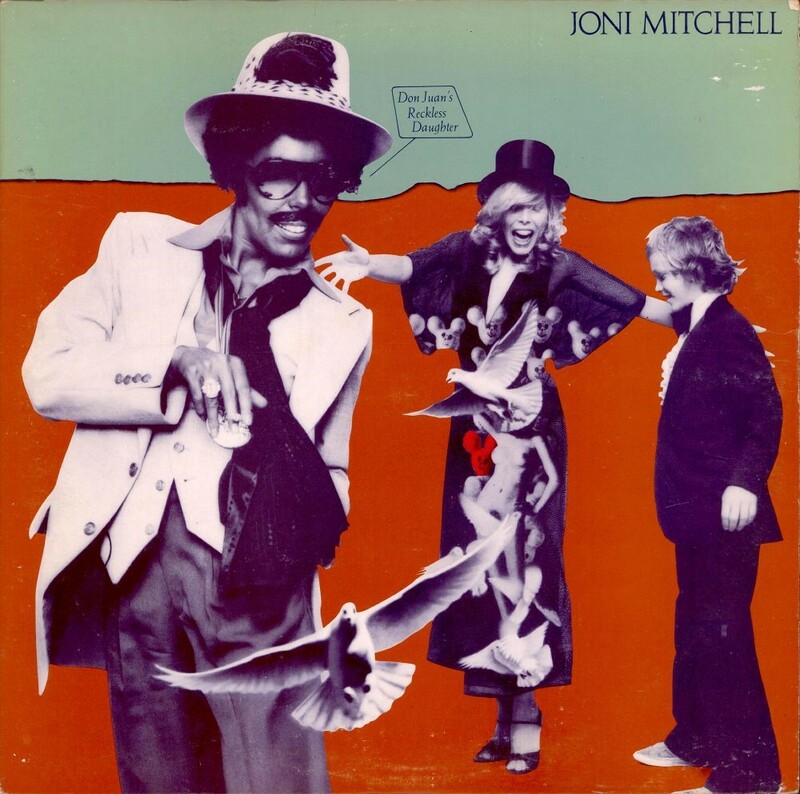 Most of the speakers referred to our subject as “Joni” rather than “Mitchell”. In the round-table discussion at the end, someone suggested this implied an unwarranted level of intimacy, and indicated an unconscious sexism on the part of the participants. There was quite a bit of agreement with this, but I don’t buy it. I think we refer to Joni Mitchell as “Joni”, when we don’t refer to Paul Simon as “Paul” for two reasons: one practical, one fundamental. First, because Joni is a rare and distinctive name, whereas Paul could be Paul McCartney; and second because the high level of self-disclosure in Joni’s music creates the impression of intimacy. I don’t think it’s anything to do with her being female and Simon being male. I can certainly see how that cover makes people uncomfortable in 2015, and I can easily imagine that it would have done even in the very different climate of 1977. On the other hand, it felt a bit strange to be part of a 100% white audience debating this. I’m not sure what conclusion would be appropriate, so I won’t attempt one. Finally, the demographics of the conference were maybe the biggest surprise. I’m not good at noticing race, so I may have missed someone; but as far as I’m aware there was not a single non-caucasian face at the conference. And perhaps even more surprising, in a conference about a feminist icon[*], although the attendance was about 50-50 men and women, the programme was dominated by male speakers. From a quick scan of the programme, I make it 15 men to 7 women, so more than twice as many. As with most of what I’ve said here, I have no idea what to make of this. I just offer it up as an observation, and I’ll be glad to know what others make of it all. [*] Joni Mitchell has explicitly disowned the description “feminist” on more than one occasion; but as a woman who not only held her own in man’s world but by most judgements dominated it, she is certainly an admirable example of practical, if not dogmatic, feminism.